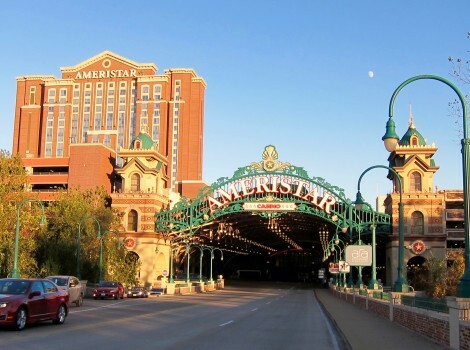 One can gamble on any restaurant that is run by Don Yamauchi being terrific and Asia, at Ameristar Casino in St. Charles, Missouri, is a sure winner. Chicago born Yamauchi grew up with a love of fusion food fed by his second-generation Japanese-American father and Filipina mother. After attending culinary school, he worked in a variety of restaurants, adding French culinary skills to his repertoire and racking up awards such as “Top Ten New Chefs in America” (Food & Wine Magazine) and “Top Five Rising Chefs in America” (James Beard Society). 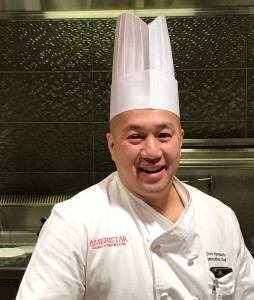 Ameristar Casino won big time when they hired Yamauchi as Executive chef in February of 2016. 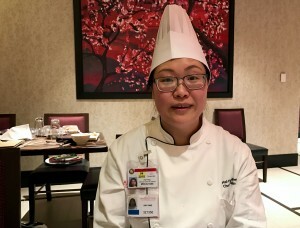 And Yamauchi hit the jackpot the next September when he hired Hai-Ying Bushey, a native of Guagzhou China, to head the casino’s remarkable Asia restaurant. 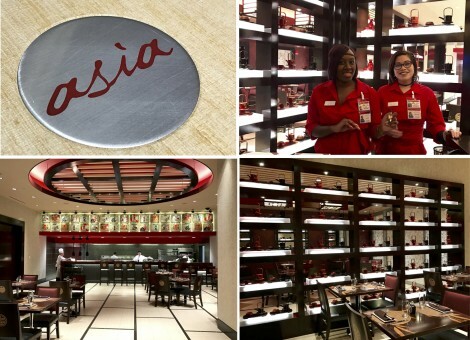 Asia sit on the casino floor, tucked into a quiet spot behind the gaming tables. A see-through partition filled with tea sets divides the main dining room from a smaller one that can be used for a private party as needed. 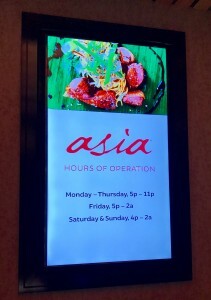 With a sleek, sophisticated design, Asia offers a lovely, quiet setting to showcase it’s remarkable food. In a medium-size mixing bowl, lightly beat egg whites with 1 tablespoon salt and 1 teaspoon white pepper. Beat in 1/4 cup cornstarch and then 1/2 cup soybean oil. Add shrimp to bowl and toss well to coat all shrimp with mixture. Cover bowl and refrigerate for 2 hours. Put enough soybean oil to cover shrimp in a deep fryer, wok or skillet and heat to 350°F. Drain shrimp well and then toss with 2 cups cornstarch. Shake shrimp to remove excess cornstarch. Drop shrimp into hot oil and fry 2 minutes. Drain shrimp and put in medium-size mixing bowl. Add honey walnut sauce and toss until shrimp is evenly coated. Transfer to a serving dish. 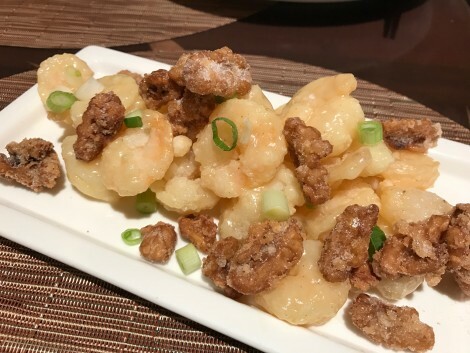 Sprinkle with candied walnuts and green onions. Put all ingredients in a medium-size mixing bowl and stir until well blended. Bring water and salt to a boil in a large saucepan. Add walnuts and blanch 20 seconds. Drain well. Put walnuts in a container with sugar. Put lid on container and shake well to evenly coat nuts with sugar. Put enough soybean oil to cover walnuts in a deep fryer, wok or skillet and heat to 350°F. Add walnuts and fry for 1-1/2 to 2 minutes. Cover a baking sheet with parchment paper and spread walnuts over parchment paper. Cool to room temperature. Store in an air-tight container. When it comes to Asian restaurants, you can bet your bottom dollar that diners who hit the tables at Asia come out big winners. And as an extra stroke of luck, the bill comes in a super large, delicious fortune cookie. Win win all around. For more information see: ameristar.com/st-charles.